The plethora of visible and hidden meanings inherent in jewellery make for an incredibly interesting profession, says jewellery designer Ted Noten. Not only does jewellery say something about its owner, it is also revealing about the society in which its owner lives. 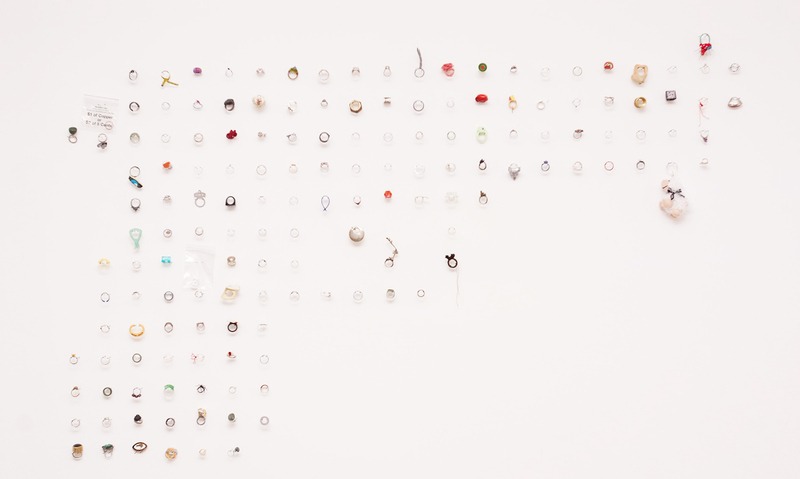 For his Wanna Swap Your Ring project, Noten has gone in search of the soul of cities. 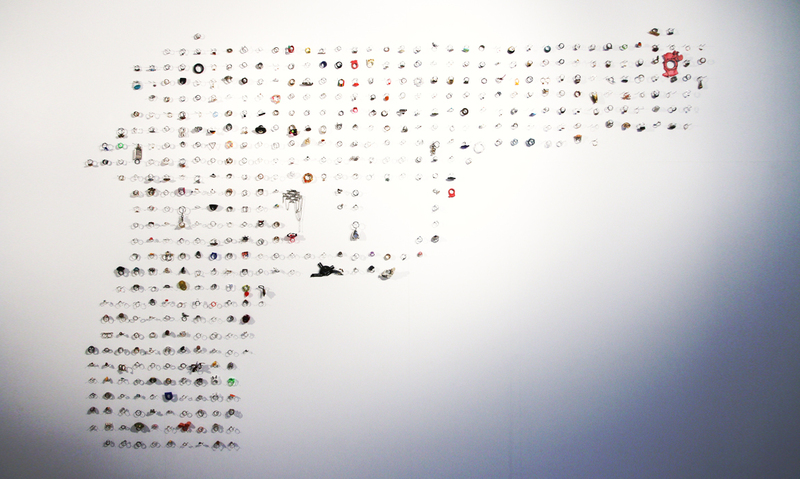 He asked himself what image would emerge if he were to place the jewellery owned by a city’s inhabitants alongside each other. What stories would emerge from such a project? But first he needed to “tempt” people into entrusting him with their precious goods. He decided to count on people’s greed and opted for the oldest strategy: the swap. In order to set the exchange in motion Noten has created a provocative and attractive installation. 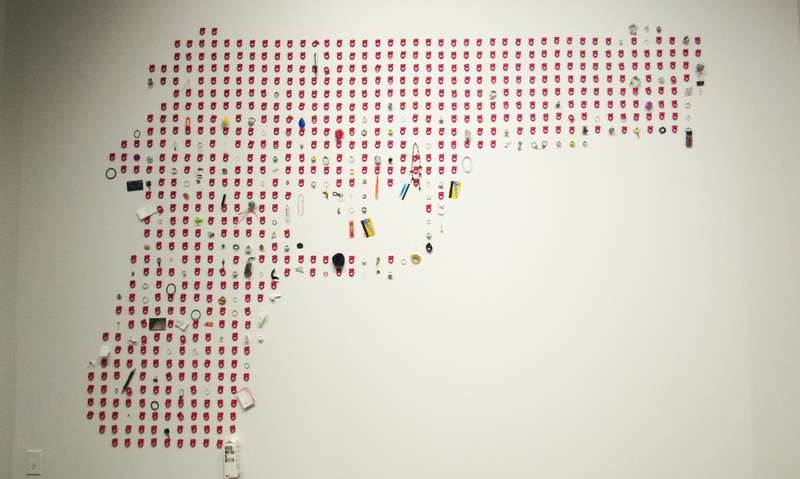 He has mounted 500 Miss Piggy-rings in shocking pink on the wall of the exhibition space, all placed within the imaginary contours of a handgun. Spectators can obtain a ring made by the master by replacing it with an old one of theirs. What counts is not the value. Noten is equally happy to receive precious rings or cheap ones. What counts is the exchange of old stories and new ones. 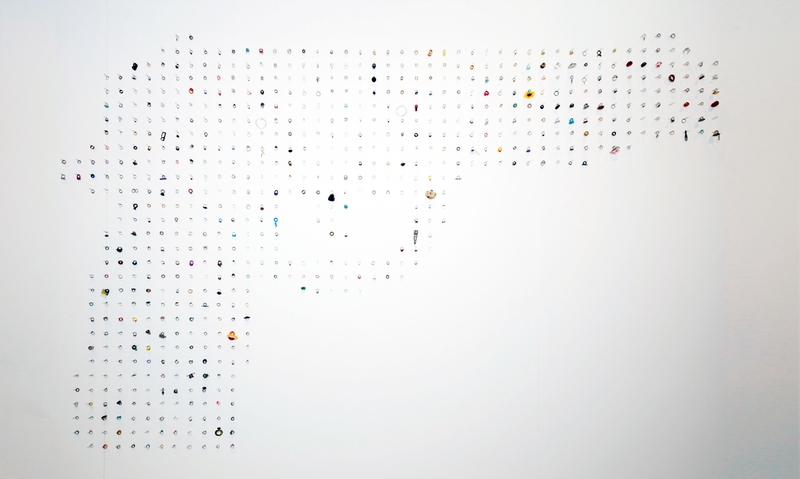 All the stories together will gradually fill the pistol-shape, changing the symbol of aggression into a charming and multi-faceted scene. A shift in meaning occurs, as is often the case in work by Noten, who has a penchant for combining opposing symbols. 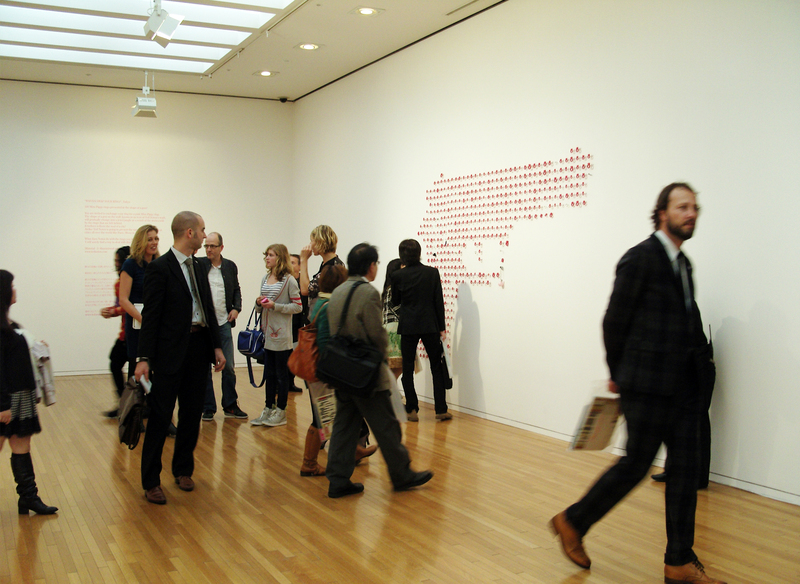 For the attentive viewer, the interactive installation holds countless different meanings. So far the project has been created in six cities; Tokyo (Japan), Stockholm (Sweden), Wellington (New Zealand), San Francisco (USA) and Riga (Latvia) and Den Bosch (The Netherlands). Other cities will follow, including London, Paris, Milan, Sydney, São Paulo, New York and Moscow. When he has been to 15 cities, Noten intends to display all the original presentations alongside each other. Doubtless this will offer a new perspective on the differences between the various versions. 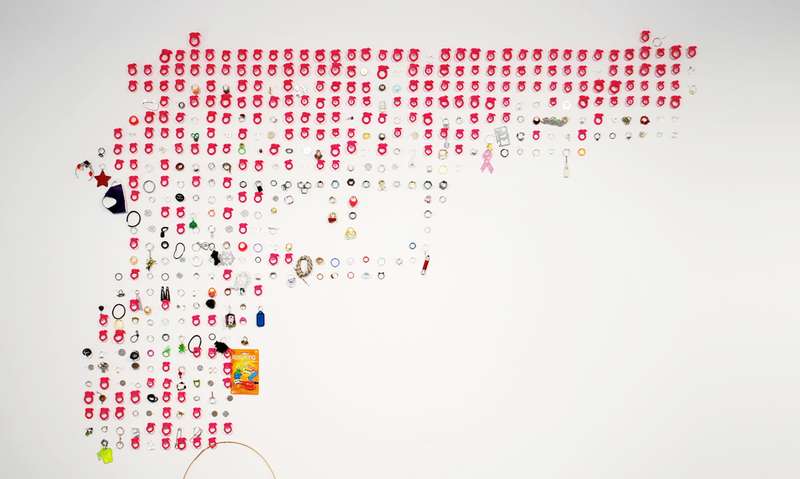 What kinds of intimate stories, relationships between jewellery and users, and what kinds of socio-cultural patterns will the different installations reveal? 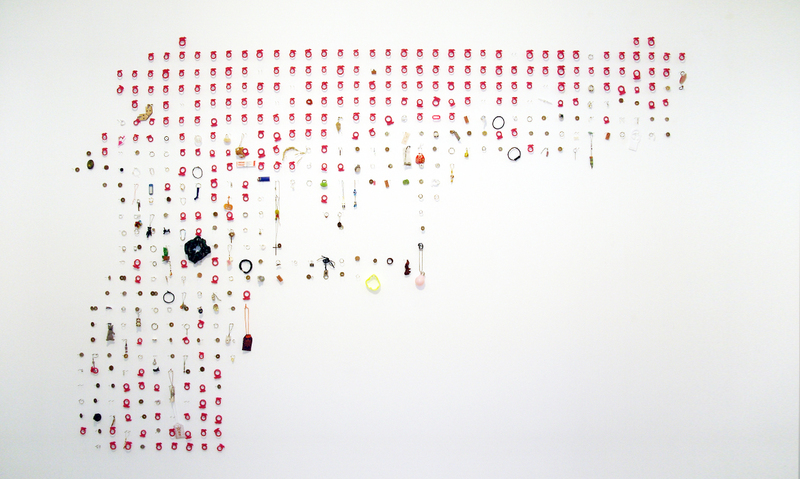 What kinds of rings have the people of Tokyo donated? How readily did the people in Stockholm or New York part with their wedding rings, a precious inheritance, or that fun little throw-away ring they once bought at a market stall? Cities are made up of people, who each possess their own intimate history, their modest and not-so-modest personal desires. By presenting the jewellery from several cities in one museum, Noten offers an unparalleled insight into the unique character of each city.